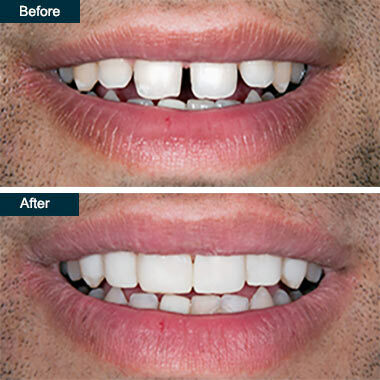 Teeth bonding is a cost-effective way to cover cosmetic dental flaws and repairing minor injuries. Dental bonding in Yonkers, used for teeth contouring, is made from composite fillings. Reshaping teeth is required when you injure a tooth. White filling material matches the color of your teeth so no one notices you’ve had cosmetic bonding in Yonkers. And dental bonding costs less than crowns. When you see dental bonding before and after photos, you’ll see the value in teeth reshaping. Dental bonding refers to a tooth-colored resin material, called a composite filling. Your Yonkers dentist applies it to your teeth for teeth reshaping. The curing material chemically bonds the resin to your teeth to restore and improve your smile. Your dentist, open on Saturdays, may use dental bonding for several reasons. Depending on the reasons for dental bonding, very little preparation is required, and you may not even need anesthesia. The bonding offers both cosmetic and restorative benefits, as the material is colored to match your natural teeth. If filling a cavity, drilling or working near a nerve, your dentist uses local anesthesia. A shade guide matches the composite to your surrounding teeth. Your dentist, open on Saturday , conditions the surface of the tooth so the composite filling adheres to the surface. The application of tooth-colored resin follows in layers to build up the tooth. Your Yonkers dentist molds and smooths the resin. Next comes hardening the material with a special light. Finally, your dentist trims, shapes and polishes the material to match your surrounding teeth and provide a good bite. The process usually takes 30 to 60 minutes per tooth. Dental bonding before and after results are completely natural-looking. The composite resin’s versatility makes it one of the most affordable dental procedures for restoration. Dental bonding costs range from $100 to $400 per tooth, and most dental insurance companies pay at least part of the cost. The procedure can be done in one visit unless several teeth are involved. Your dentist removes much less tooth enamel than with other techniques, such as for a crown. Plus, there’s no unusual aftercare. However, the composite material doesn’t resist stains as well as porcelain crowns. Also, the material can sometimes wear or chip away. If you’re asking yourself, how long do composite fillings last, you can expect three to 10 years, depending on where it is in your mouth and your oral care habits. Other dental remedies last longer. Cosmetically, composite resin — with its white filling — looks and feels like your natural teeth. For repairing and reshaping teeth near the front of your mouth, this dental bonding procedure works very well. If you need repair to your molars, your top dentist I the Yonkers may advise a different procedure. Your budgetary needs, confidence and dental health determine your choice. Do you have any questions about the Dental Bonding (Cosmetic Teeth Bonding) procedure in Yonkers? For more information or to schedule an appointment with the best rated cosmetic dentist in Yonkers, Westchester NY please contact our dental clinic for consultation. Cosmetic & family dentistry in Yonkers, Westchester County. One-stop dental clinic for all of your oral health needs. Our family and cosmetic dentists are pleased to be serving the community of Yonkers, NY. We offer high quality family and cosmetic dental care at a reasonable price. The most important person in our dentistry practice is YOU, and our dentists do our best to demonstrate the commitment to you every time you visit our Yoners dental clinic. Our site is the source of information about the dentistry related conditions and procedures. This information is intended for patients looking to learn about our dental practice in Yonkers and make an appointment to see one of our dentists. This information is only intended to provide guidance, not definitive medical advice. Please consult a Yonkers dentist about your specific condition. Only a trained family or cosmetic dentist in Yonkers can determine an accurate diagnosis and proper treatment. Terms and conditions are subject to change.